Spring has sprung and with that comes all of our favorite outdoor activities. Hiking, biking, and exploring the beauty of the Niagara area are just a few of the opportunities guests can enjoy during this time of the year. 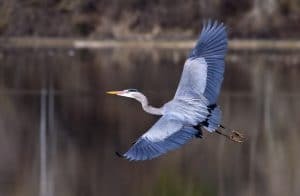 However, one of the most popular of the springtime outings in the region involve our fine feathered friends. Whether you’re an avid birder or just love to see love to see wildlife in their native habitats, Niagara is the place to be. In fact, the Niagara Corridor is designated as a Globally Significant Important Bird Area, due largely in part to the sheer number of native and migratory bird species in the area, and spring and summer are the best times to see them. Be sure to pack your binoculars and visit Niagara Falls birding hotspots to witness some of these magnificent creatures on your next vacation. Not only can you take in the sweeping views of Lake Ontario from Beamer Memorial Conservation Area, but it’s also the best place in the region to spot bald eagles, vultures, and other birds of prey. The hiking trails are well maintained and some of the trails are wheelchair accessible. The lookout platforms are the best vantage points to spot the eagles as they soar on the updrafts of warm air. You may also see herons, egrets, and numerous songbirds here as well. As a man-made marshland, Mud Lake Conservation Area is vital to the health and safety of migratory birds and is a bird watcher’s paradise. Several trails wind through the wetlands and there are wildlife viewing blinds that are accessible by canoe. Waterfowl are abundant here and you can see many different types of ducks, geese, egrets, herons, and perhaps even a magnificent swan. The conservation area is open all year, but spring, summer, and fall are the best times to catch a glimpse of the birds. Once a limestone quarry, the Wainfleet Wetlands Conservation Area is now an important sanctuary for birds, reptiles, mammals, and native plants. This area was also part of an ancient shallow sea, so fossils of long extinct plants and animals can be seen in some of the exposed quarry walls. It’s important to be careful here; some of the fossils have been damaged or stolen by careless or unscrupulous visitors. 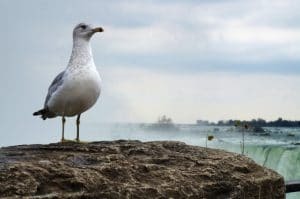 The Niagara area is home to more than 19 species of gull, and you could possibly see them all here. In addition, you can spot terns, herons, egrets, and many more wading and shoreline species. The conservation area is open year round and does offer hunting on strict schedules and with proper licensing. Birds are one our best connections with nature, and once you begin to pay attention to their activities it’s almost impossible to stop. Make your next trip to Niagara even more special by visiting one or more of these incredible bird watching sites. Who knows? You may even leave a self-described birder for life.